With No Prayer for the Dying, Iron Maiden attempted at recording an album that had them returning to their roots. For some reason, the album featured absolutely no material in the same league as the likes of Rime of the Ancient Mariner, Aces High, and Caught Somewhere in Time, or hell, even Stranger in a Strange Land. Yet somehow the album still did very well commercially, as most Maiden albums do, hitting #2 in the UK charts. This was in to small part due to the album's singles Holy Smoke (#3) and quite strangely, the awful Bring Your Daughter…To the Slaughter (#1). The mainstream sure works in strange ways…Anyways, on 1992's Fear of the Dark, the band again took the same direction as No Prayer. Again, the album sold very well, hitting #2 in the UK charts. This time however, Iron Maiden seemingly put a lot more effort into the album, and as result, came out with a better album. What really brought down No Prayer for the Dying was the lack of classic, or even superb, Iron Maiden material. This is all changed with Fear of the Dark. Though many of the songs are still sub-par by their standards, (with even some of the dreaded "filler" tracks) with songs such as Fear of the Dark, Wasting Love, Judas Be My Guide, and Afraid to Shoot Strangers, the band returns to the lofty heights that they enjoyed for the entirety of the 80's. A big part of this comes in result from the band straying from the general hard rock meets metal approach the band employs throughout the album (surprise surprise…"), and more into the familiar Iron Maiden path. Wasting Love is the exception here, as it has the band attempting a ballad, atypical for Maiden. Much like the previous album, Bruce Dickinson employs a raspy singing style. Again, much like No Prayer for the Dying, he sounds awful. This is for the majority of the album as well. You want examples, now" The opening track Be Quick or Be Dead is a good example. Bruce's rough vocals destroy what could have been an excellent track. Same could be said for From Here to Eternity. However that track would have been less than a classic anyways. This is true for a great deal of the album, but there are occasions where he gets things right. In particular, we have Judas My Guide and Fear of the Dark. In both of these songs, however, the throaty vocals thankfully take a backseat to Bruce's operatic voice. The raspy technique is still present, but Bruce surprisingly gets it done successfully. The other two superb songs, Afraid to Shoot Strangers and Wasting Love, contain next to no raspy vocals from Bruce. As a result they are more enjoyable to listen to. To bad these instances are few in a sea of mediocrity. Fear of the Dark ended up being the last album in eight years to feature Bruce Dickinson. This is a good thing, as Bruce admitted that he was not totally into singing for Maiden, and wanted to focus more on his solo career. There's no point in having someone on deck if they aren't committed to helping out is there" No matter, how unfortunate it was for Bruce and Maiden to part ways, it was for the good of both parties. Besides, Bruce had sounded terrible on the past two records anyways, and was becoming an albatross for the band's music. As with No Prayer for the Dying, Fear of the Dark is not an essential Iron Maiden album, however what separates it from the previous album are excellent songs such as the title track and Wasting Love. Definitely not Maiden at their best. Congrats Mike, a fine way to finish off your reviews for Maiden (well, their studio albums anyway). Cause that songs owns hard. Congrats on doing them all. That's no easy feat. Good review man. 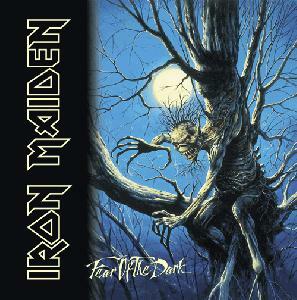 I enjoy this album, Fear of the Dark is a song that no one can ever get enough of. I almost bought this a few days ago, simply because the version of Fear Of The Dark on RIR is one of the coolest things ever. I'm glad I didn't now. Great review...way to finish off a series. you were doing well until you described "bring your daughter to the slaughter" as awful... it may be cheesy, but its a great song! Keep pestering them until they do all the live ones too. By them, do you mean me? This album is a classic in my eyes. Fear Of the Dark Iron Maidens best song. fear of the dark and childhood's end are definetly highlights of this for me.